I knew that those troublemaker sunspots were rotating back into view this week, but I was still afraid to get my hopes up too high. The gate agent saw the geeky glint in my eye and was kind enough to reassign me to a window seat on the northern side of the plane. I was going to try to see the aurora. My last image of America was a silent television channel showing images of Michael Jackson and saying something about an arrest warrant. I thought to myself "boy am I glad I don't have to deal with this". I was heading to Iceland, and I estimated the chances of Bjork being put on trial for child molestation as nil. It was one of many reasons I was glad to be leaving the country. What finally convinced me to make this journey (which I cannot really afford) was this prospect of spending nine hours in Iceland on a layover. I figured I could get off the early morning plane, ride into Reykjavik, and be back in time for my afternoon flight to Amsterdam. I had always wanted to visit Iceland, but since it comes right after Japan on the list of most expensive tourist destinations, I figured I would never get to go. Now I had the perfect chance to conduct a surgical tourism strike - in and out before the authorities would have time to attach the suction hose to my wallet. It was a spectacularly clear night over New England, the kind where you can see every city and major road as a little string of interconnected lights, intricate and beautiful. Down on the ground, it's all WalMarts, Kwik Stops and cars blocked in traffic, but from twenty thousand feet it looks like jewelry. I got my aurorae. The light shows started somewhere past Labrador. I had seen the northern lights from a plane once before (flying home from Cincinatti), but then they were only the faintest glow over the northern horizon. The only way I recognized them was because they slowly changed shape over time, with an occasional rapid flickering, like a computer screen filmed by a TV camera. These lights were unmistakable. There was a distinct green ribbon snaking from west to east, and though my mind knew that it had to be a hundred miles above us, a trick of perspective made it look like it was at the same altitude as the plane. As I watched, the ribbon intensified and diminished - parts of it growing so bright they began to show colors, and then dimming back down again. Above the ribbon were long streamers of green light, whizzing around. Like an idiot I ignored the spectacle to eat my dinner, and of course it was gone when I went to look again. It stayed gone for an hour or so, but as we crossed Greenland the ribbon came back, much brighter this time, and with two of its friends. They looked for all the world like they were above, below, and at the same height as the plane, and all three were wriggling intensely. Big snakes playing in the sky. The people in front of me were huddled at their window, too, which made me happy. The plane jumped around and shuddered, but I had found the cure for turbulence. Iceland is disturbingly new. I don't mean that the buildings and habitations are disturbingly new, although there is not much that survives from before the nineteenth century, but rather that the land itself, the stuff you walk on, doesn't have a good track record of just lying around and being there. My own corner of Vermont is built from sediment and sludge that has eroded off the Appalachians since they were Himalaya-class mountains two hundred million years ago. 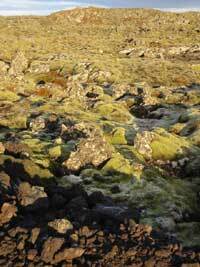 By contrast, the lava flows near Reykjavik date back to 1266. They're practically still warm. The country has two hundred thousand earthquakes a year, most of them undetectable, and it's slowly spreading apart. Most of the population shares our fondness for the North American plate, and is westbound, but the lion's share of the island (including the bit where Bjork lives) is heading east with Europe. Everything about Icelandic geography screams 'Under Construction - Please Come Back Later! ', but the Icelanders are a stubborn and resourceful people, and seem perfectly content to wait it out while the various volcanoes do their business and the lichen gingerly get to work turning the rock into something approaching soil. So what if the locals have to make fenceposts and houses from (Siberian!) driftwood, and import whatever wood doesn't float in of its own accord? And so what if the occasional polar bear also floats in, arriving hungry from Greenland on an ice floe, and has to be destroyed before it makes a dent in the population? Iceland has about half as many people as Vermont - somewhere in the neighborhood of 300,000, - spread in a ring shape around an empty interior. The jewel in the ring is at Reykjavik and the adjacent penninsula, where half of the population lives. The interior is so desolate that even Icelanders won't live there, which is pretty much the definition of "uninhabitable". Keflavik airport sits on a penninsula about half an hour's drive west of Reykjavik, the capital. If I have my facts straight, the airport dates from the Second World War, when the government looked at a map, looked at its census figures, and asked the British to invade them before the Germans did. The airport had an illustrious Cold War history, too, and now serves as a critical source of smoked salmon and cable sweaters for air passengers on the transatlantic route. I arrived a little past six in the morning, exchanged fifty dollars for some Icelandic funny money and got straight on the bus to Reykjavik. It was pitch black out, so there was nothing to see on the ground (daylight later on didn't change that, the area turned out to be a lunar landcape of rock). But my eyes were glued to the window, because the unearthly light show in the sky was still going on. If you have never seen the northern lights, the best description I can come up with is 'enormous things happening quickly'. The still photographs don't convey the rapid, strangely biological way the aurora pulses and dances around you. It catches your attention. The bus let us out at a hotel in the middle of a gigantic, empty field. This field turned out to be another airport - the domestic one in the heart of Reykjavik - and there was about a mile of open ground between me and the city. It was eight o'clock and there was not the barest hint of dawn. The ground was slippery with frost. It was not an auspicious beginning, but then again I had made it to Iceland, the northern lights were out in all their beauty, and God in his providence had given me a functioning pair of legs and a decent hat. I spotted a footpath up ahead and, feeling like MacGyver, verified that it headed north by looking up and finding Polaris. Naturally the star was almost directly overhead. "You're about as far north as it gets, you dumb Polack!" it said. The Chicago Tribune used to have a great columnist named Mike Royko, who was an institution at the paper for many years before his death. One of my favorite columns of his described a practical joke he and his fishing buddies once played on a gullible friend. They waited for him to fall asleep at about ten o'clock, quietly reset his watch and all the clocks in the fishing cabin to be four hours fast, and woke him up at midnight to head out onto the water. They played dumb while he slowly began to panic, as hour after hour passed with no hint of the sun. They managed to keep a poker face until he stood in the boat and started screaming "WHERE IS THE SUN?!?" at the eastern horizon. I felt exactly like that guy on my morning in Iceland. On the bus, I had been anxious that the sun would rise before I could go out and look at the aurora from a dark field, but I needn't have worried. It took me an hour to cover the first mile, mainly because I kept staring up at the beautiful sky, and there was no hint of sunrise. The aurora brightened and faded every ten minutes or so, until suddenly Someone turned the switch up to 11, and the northern sky just ignited. It was no longer a green light, but sheet of white, yellow and red covering the entire horizon. I stared at this grand finale, took a useless picture, and decided when it ended that I had better find my way to a hot beverage before I froze in place. I wandered into the city at nine o'clock, with now the barest hint of blue on the eastern horizon. People were bustling about their morning business - doctors in well-lit offices doing paperwork in their lab coats, moms bustling well-bundled children off to school. A whole bunch of young kids were playing soccer on a playground. It was a disorienting sight - my body clock felt like it was two in the morning, the sky certainly reinforced that impression - and so I had to resist the urge to yell at the kids to go home and go to bed. The Icelandic language looks like a bad night at the Scrabble board, so any bit of writing proved entertaining in my altered state. I read off road signs, parking regulations, and when I got bored with the Hringbraut song went back to repeating a public health slogan I had seen at the airport - "Smokkur fyrir okkur" - which is Icelandic for "Take care - with condoms!" 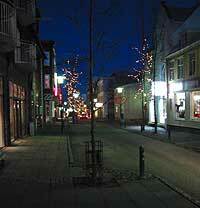 At half past nine I was in Reykjavik's pretty shopping district, which is strung up with white Christmas lights. Delivery men were running about, but to my horror all the cafÃ©s were closed. The only places open seemed to be sweet shops, all of them sporting a big Coca-Cola sign. I walk along down to the water, where it was now bright enough to clearly see the great mountains across the bay. The harbor was beautiful, with dozens of fishing boats and ships of all sizes moored in the still water. Wherever it is that people of Reykjavik go to eat a tasty, hot breakfast, I did not find that place. The best I could find was a gas station, where I bought a cup of something masquerading as coffee, and headed back into the chill morning. A few more blocks brought me to the large square pond in the middle of the city. 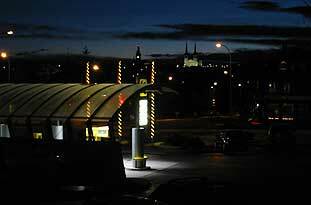 It was a pretty kind of park, with row houses along one edge, and a big modernist building anchoring the downtown side. A large number of ducks and swans were swimming in what was essentially an ice bath. 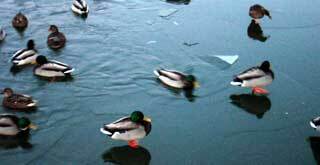 Other ducks were standing on patches of invisible solid ice (hallelujah!). I had to admire the powers of denial or self-discipline it takes for a migratory bird to sit in ice water at sixty four degrees north latitude in November, thinking "no worries". Ten o'clock, and I could see! The sun wouldn't actually clear the horizon until eleven, but I knew it was officialy daylight because the streetlights winked out. It wasn't terribly cold out - a mere thirty one degrees - but I had a heavy backpack on, and however charming the city, the prospect of spending another five hours pacing through Reykjavik was disheartening. 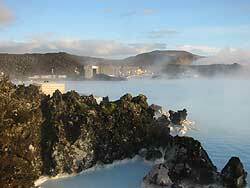 I decided to take the advice of the woman who sold me my ticket into town and go catch the eleven o'clock bus to something called the "Blue Lagoon" - a geothermal spa from where you could continue directly to the airport in time for an afternoon flight. It sounded like a tourist trap, but it also sounded like a warm place where I could sit down, so I made my way back to the desolate bus stop. The bus driver turned out to be a very amiable man who looked spookily like John Ashcroft. 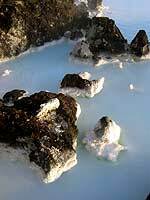 We climbed in a microbus, picked up a French couple shivering back in town, and then headed off to the Blue Lagoon. Ashcroft was an excellent, low-key guide, and pointed out interesting sights like the President's house and the stretch of road where we were most likely to see an arctic fox (there is a hen coop nearby that the fox is apparently fond of). Leaving the westernmost of the towns adjacent to Reykjavik, we emerged onto a featureless field of rock - it looked like the surface of the moon. Up ahead stood an enormous factory built on an empty lava field. This turned out to be an aluminum plant - power is so cheap here that it's profitable for Iceland to import Australian ore just to smelt it into metal. As we neared the Blue Lagoon (visible as a giant cloud of steam halfway up the ridgeline) Ashcroft explained that there are three things cheap in Iceland - water, air, and electricity (though I bet you could also get a good price on igneous rock). 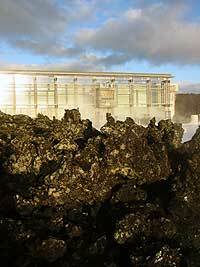 To make power in Iceland, you just have to dig a hole, stop when you hit superheated sea water, and build a geothermal plant on top. 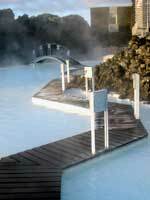 The Blue Lagoon, fancy name nothwithstanding, is basically a repurposed runoff pond for one such geothermal plant. The pressurized water comes out of the ground at 240 degrees Centigrade, but is cooled to a more endurable 38 degrees before reaching the bathing area, to avoid poaching the patrons. The lagoon has a funny origin. When the power plant was built, water was just dumped onto the ground, where it was supposed to percolate back down through the porous lava. But instead it formed a little hot lake, which quickly became an illicit swimming spot for local teens. When teens with skin problems started suddenly being cured of psoriasis and other serious afflictions, it naturally attracted some attention. After much interrogation, one of the teens owned up to taking nighttime swims in the runoff pond, and a great spa was born. The water was mildly curative, full of beneficial minerals and blue-green algae, and it probably didn't hurt that the site was ten miles from the international airport. The spa complex is nicely built - as you approach it, you see enormous clouds of steam billowing far into the air, much like they do from Middlebury College's ridiculously ill-designed Center for the Arts, which burns through $800,000 worth of heating oil every winter (oops - that's confidential!). The approach to the spa is through a kind of deep trench through the lava, which is foamy and dark and looks very lethal, making you reflect uneasily on the recentness of its arrival. The spa itself is spacious and full of nice thoughtful touches - you can rent a swimsuit (because who thinks to pack one, to Iceland?) and you are given a little waterproof bracelet with a tag on it that lets you in the main swimming area and also serves as an electronic key for whatever locker you choose to leave your stuff in. The locker rooms even have hair dryers, although none of the men I was with wanted to look like a sissy and actually use one. After changing and showering, you walk out into the freezing cold and yelp your way into the enormous pool of blue water, which is four feet deep and covers at least an acre. It's like being in a hot bath, assuming your tub is lined with volcanic rock and is full of Norwegians. The water is an opaque sort of turquoise and quite salty. A lotion-like substance precipitates out of the water in places, and it is sold by the spa staff as an expensive cosmetic cream. To me, it felt more like pond muck back in summer camp, squeezed between my toes. But I notice that my feet have been lovely ever since. Once you leave the spa, you walk straight into a restaurant. The atmosphere is convival, Norwegians notwithstanding, and the room even lets in great portions of sunlight (stingily administered through a notch between two volanoes on the horizon). I soaked for an hour, until my hands had turned raisin-like with wrinkles, and then stood for another ten minutes under the waterfall, where it felt like hot rocks were being dropped on my shoulders. Going back to the airport, I was a transformed man. Clean, relaxed, smelling very faintly of volcanic sulfur, I had a quick meal of square meat on dark bread and then fell asleep at the gate, waking just long enough to get myself to the Netherlands. If you are flying to Europe for any reason, you would be silly not to check out Iceland Air. Just like Vegas, where they make layovers longer to maximize passenger gambling, Iceland Air tries to give you long enough between planes to zip over to the Blue Lagoon (my nine-hour layover was an unusually long exception), and the tour staff is used to whisking passengers there and back between flights. It costs a whopping $25, on top of the $304 (all taxes included) I paid for a round trip ticket between Boston and Amsterdam. Instead of spending eight hours in a plane, you can have two shorter flights with a hot bath in between, you can see Iceland, and you can arrive in Europe in the early evening, just in time to check in for a good night's sleep.